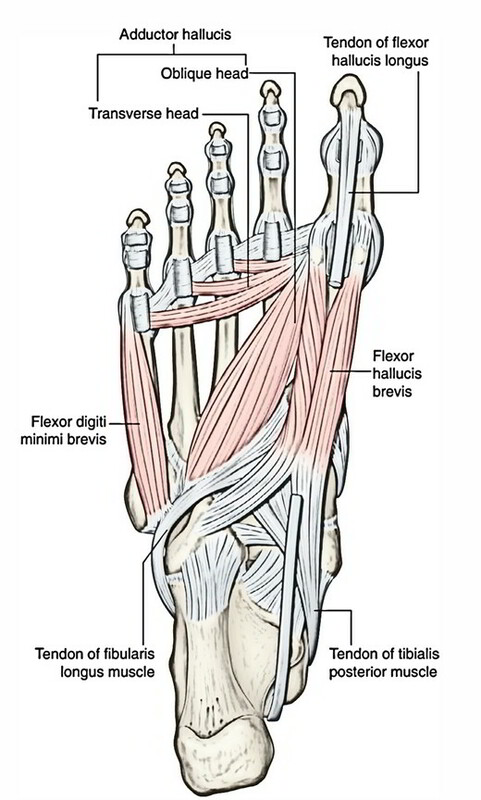 Flexor hallucis brevis is a small muscle appearing in between abductor hallucis medially and flexor digitorum brevis laterally, located deep in the sole of the foot. A sesamoid bone is found in each tendon of the flexor hallucis brevis as it crosses the plantar surface of the tip of metatarsal 1. The muscle fibres separating into two fleshy bellies to either side and deep to the tendon of flexor hallucis longus, run forwards and medially to the great toe. A tendon emerges from each belly which inserts onto the proper side of the base of the proximal phalanx. While the lateral tendon unites with the tendon of adductor halluces therefore providing common entrances, the medial tendon attaches that of abductor halluces. A tendon that inserts on whether the lateral or medial side of the base of the proximal phalanx of the great toe, emerges from each part of the muscle. The lateral head emerges behind the groove for the fibularis longus, and surrounding surface of the lateral cuneiform, from the plantar surfaces of the cuboid. The medial head emerges as it enters the sole of the foot, from the tendon of the tibialis posterior muscle. The medial plantar nerve supplies Flexor hallucis brevis, root value S1, 2. The skin covering the area is supplied by root L5. The action of flexor hallucis brevis is to flex the metatarsophalangeal joint of the great toe. Flexor hallucis brevis assists flexor hallucis longus in the last push-off from the ground throughout activities. When the great toe is warped as in hallux valgus, where the tip points laterally and the base medially, this thrust is lost and the patient discovers it hard to run or occasionally walk, even at sluggish speeds. It is not unusual for injuries to strike the sesamoid bones, especially in people who put significant strain on the great toe. Such traumas produce a swollen region where the sesamoid bone glide against the metatarsal. This can trigger great pain and altered function.